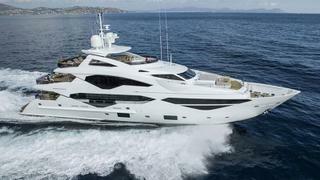 The latest Sunseeker 131 has been launched and named Lady M. The latest hull in the highly popular series, Lady M is due to be shipped to her owner on Monday July 30. She has been registered for commercial use, suggesting she will be chartered. The all-GRP motoryacht measures 40.05 metres overall with a 338GT interior which can accommodate up to 12 guests in six cabins. The crew quarters meanwhile allow for a staff of up to eight people. Lady M's interior design has been tailored to the personal preferences of her new owner and features feature glass throughout the decks to allow in natural light. The master stateroom, saloon and upper saloon are all especially light-filled, according to the yard. Exterior deck arrangements include a skydeck and upper deck aft cockpit which have been lengthened by two metres from the previous model configuration. Meanwhile the garage can accommodate a tender of up to 6 metres, as well as two Jet Skis. Based on the Sunseeker deep V hull, Lady M operates at 10 knots for an extended cruising range of 1,500 nautical miles with a top speed of 23 knots.